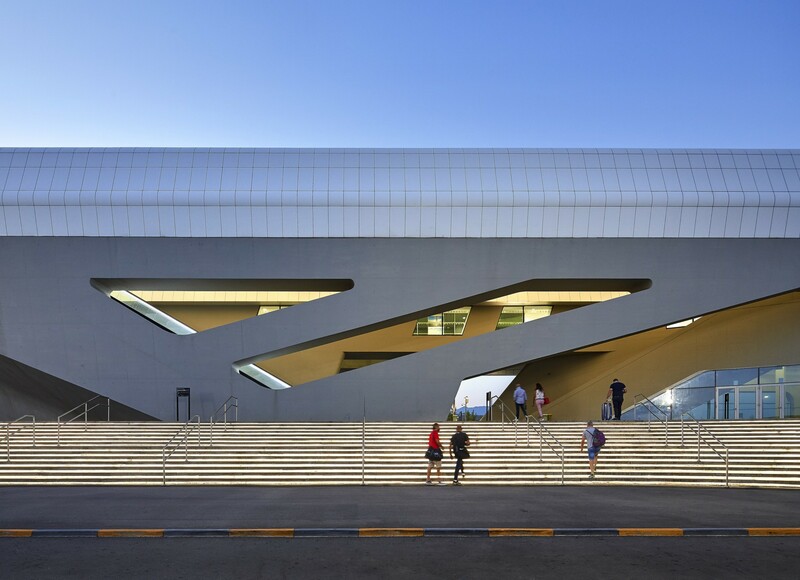 Famous architectural photographers Hufton+Crow are behind a new photo shoot of the Napoli-Afragola High Speed Italian train station, designed by Zaha Hadid Architects. 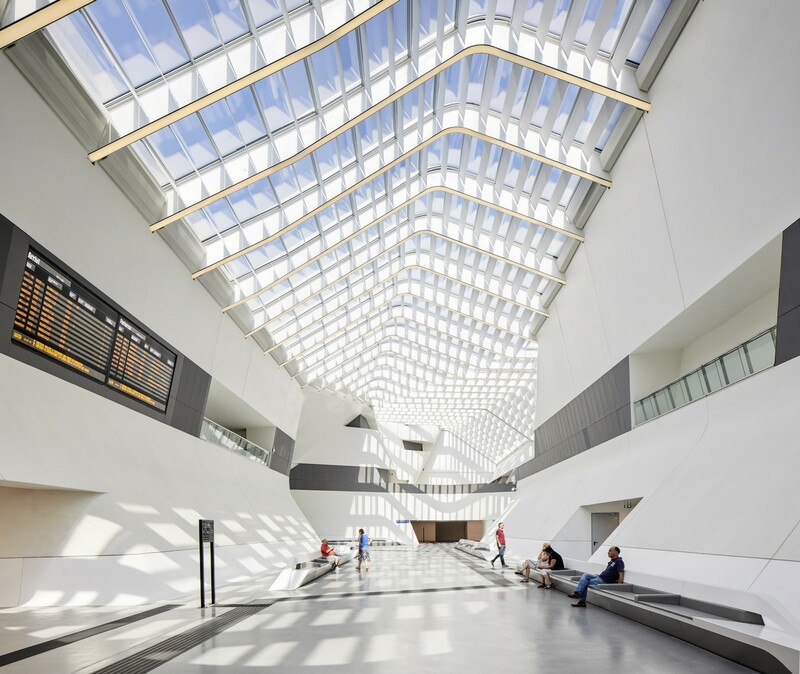 A year after the completion of the initial work phases a photo shoot by famous architectural photographers Hufton+Crow presentsthe Napoli-Afragola station on the Italian High Speed train line, designed by Zaha Hadid Architects. The first image that captures the attention is the aerial view. The photographers have portrayed the station in the wider setting of the landscape, showing the image of a serpent, snaking across its eight platforms, with the Gulf of Naples and Vesuvius as a backdrop. A fundamental element of the station designed by Zaha Hadid Architects is the raised walkway above its eight platforms with a curved 450 m long path. Its size transforms it into the main passenger atrium of the station. It is a bridge that passengers can use to directly access the platforms below, housing various services and structures for both passengers and staff. A study of passenger circulation led to the geometries of the station spaces. Everything has been calculated to reduce the distances for passengers arriving at or leaving from the station, and for those who have to catch other connections to continue their journey, to a minimum. At the ends of the building, two large entrances welcome visitors and guide them to the central atrium, where they can find information and directly access the platforms below. The atrium runs across the railway platforms, improving their environmental performance. A great deal of attention has been placed on finding architectural solutions and using suitable technologies to ensure the right amount of natural light and ventilation and to reduce energy consumption to a minimum. The station has an integrated photovoltaic and solar energy system, as well as ground source heating/cooling systems. Opened in 2017 by the Italian government, the station is around 12 km North of Naples and serves a densely populated area with towns varying from 10,000 to 50,000 inhabitants. The station has been designed as a gateway to the South of Italy, as well as an important intermodal hub for the region, with four inter-city lines, three inter-regional lines and a local commuter line, as well as parking and link services with the local bus system in order to alleviate congestion in Naples’ city centre. 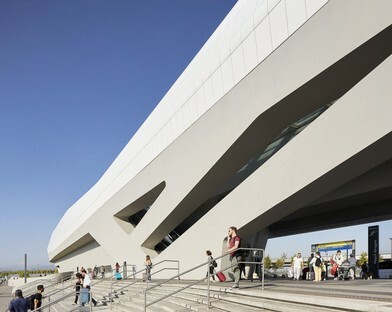 The Napoli-Afragola station designed by Zaha Hadid Architects recently received the Surface Travel Award 2018 in the “transportation – station and terminals” category. It is an award given to new architectural projects linked to travel and set up to raise public awareness of the role of design in improving quality of life also in this area. 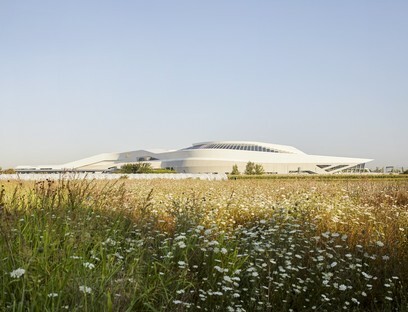 The jury’s motivation for awarding the prize was that taken as a whole, the building expresses speed, efficiency, and elegance, just like the future-leaning network it serves.